Zion Fellowship International is a Pentecostal fellowship of pastors, missionaries, churches, Bible schools, Christian schools, and orphanages. Founded in 1981, Zion Fellowship purchased, by faith that same year, the 170-acre campus in upstate New York that serves as its headquarters and the main campus of Zion Ministerial Institute. Over the past 30 years, by God’s grace, Zion’s ministry has spread to every inhabited continent of the world. Rev. Robert Tucker is the president of Zion Fellowship International, as well as the resident Chancellor of Zion Ministerial Institute, Waverly Campus. The mission of Zion Ministerial Institute is to glorify the Lord Jesus Christ by educating and preparing Christian leaders who will minister effectively in their calling to the Church, and the world, out of their ever-deepening relationship with the Lord Jesus Christ. Zion Ministerial Institute’s Statement of Faith is a declaration of our basic tenets of faith and forms the basis for our doctrine and curriculum. For the purposes of church doctrine, practice, policy, and discipline, our Board of Trustees is the fellowship’s final interpretive authority on the Bible’s meaning and application. We believe that in order to preserve the function and integrity of Zion Fellowship as the Body of Christ, and to provide a Biblical role model to the church members and the community, it is imperative that: members of Zion Fellowship, those employed by Zion Fellowship in any capacity, and who serve as volunteers, should abide by and agree to our statement of faith and conduct themselves accordingly. In particular, Zion Fellowship pastors shall not solemnize any marriages that are contrary to our Statement of Faith. 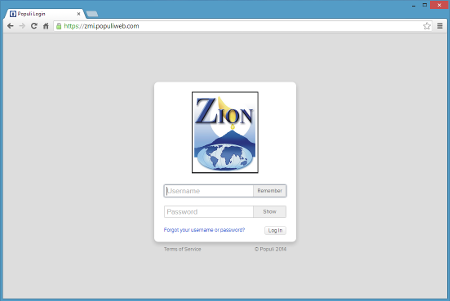 We believe that in order to preserve the function and integrity of Zion Fellowship as the Body of Christ, and to provide a Biblical role model to the church members and the community, it is imperative that: Zion Fellowship’s facilities or assets may not be used to condone or allow any activity that is contrary to Scripture or our Statement of Faith. Zion Ministerial Institute is the first school founded by Zion Fellowship International, a Pentecostal fellowship of churches located in Waverly, New York. Zion Ministerial Institute is directed by Zion Fellowship, which oversees many residential and correspondence Bible schools around the world. In August of 2004, Zion Ministerial Institute was granted Affiliate Status with ABHE, the Association of Biblical Higher Education, located in Orlando, Florida. Zion Ministerial Institute is a residential, co-educational post-secondary Christian school, owned and operated by Zion Fellowship, Incorporated in the state of New York, USA. Zion Ministerial Institute holds a state charter classified under section 52.22(b) of the New York State Department of Education, which authorizes vocational instruction in the field of religion. Zion Ministerial Institute is authorized by the State of New York to grant certificates and diplomas of completion in the area of ministerial training. Zion Ministerial Institute does not accept federal or state funding.